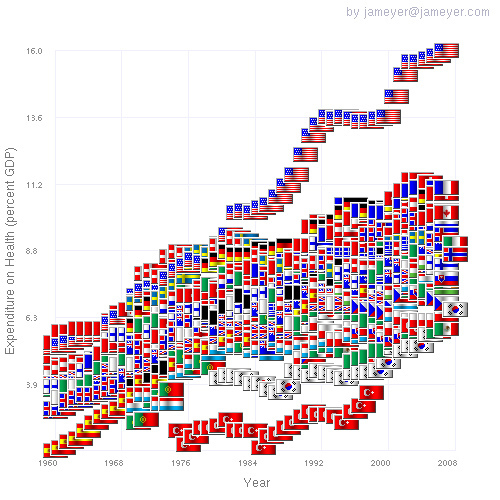 We spend 50% to 100% more than most other developed nations to achieve similar health outcomes. If growth were to continue at its current pace, the whole economy would be dedicated to healthcare before the century was over. Clearly, this falls into the category of “what can’t go on forever, won’t”. What is not clear at this point is what that curtailment of growth will look like (i.e., constraining who is covered, what is covered or what it costs). This entry was posted by David on December 21, 2010 at 6:53 pm, and is filed under Health. Follow any responses to this post through RSS 2.0.You can leave a response or trackback from your own site.